The OprF is a major outer membrane protein of Pseudomonas aeruginosa. This protein functions as a nonspecific porin to allow the passage of small hydrophilic molecules, plays a structural role in maintaining cell shape and outer membrane integrity, and is required for growth under low osmolality. The structure of OprF has been proposed to consist of three domains, the N-terminal forming h-barrel structure, a loop or hinge region, and the C-terminal associated with peptidoglycan. Based on the predicted secondary structure and information found in the literature, we chose 188aa(Val) as potential fusion sites for displaying CBP. CBP is the abbreviation of copper binding peptide made up of seven amino acid. In order to reduce the effect on the CBP activity，we added (GS) linker between OprF fragment and CBP . Plasmid pET28a-oprF was transformed into E. coli BL21(DE3) for protein expression analysis. The strain was grown in Luria broth containing 100ug/ml kanamycin at 37℃, 250rpm/min until an absorbance of 0.4–0.6 at 600 nm was reached. 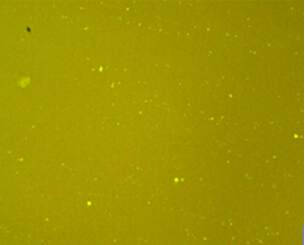 We then added IPTG to 0.5mM and continued the incubation at 28℃ overnight to induce the overexpression of oprF. The cells were collected, suspended with 10mM imidazole containing 0.1mM protease inhibitor PMSF and then disrupted using Selecta Sonopuls. After centrifugation, the sediment was treated with 1*SDS gel loading buffer and kept in boiling water for 5 minutes and applied to SDS-PAGE. To identify that whether our oprF has anchored on the cell membrane of E. coli, we performed immunofluorescence assay. 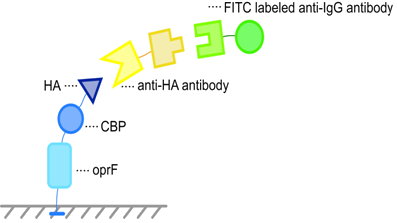 HA tag was added to the N-terminal of oprF-GS(linker)-CBP so that the recombinant protein oprF-GS(linker)-CBP-HA can be specifically recognized by anti-HA antibody. When FITC labeled anti-IgG antibody was used as the secondary antibody and interacted with the primary antibody, green fluorescence could be observed in the cell membrane of E. coli under fluorescent microscope. Figure SDS page test of purified recombinant oprF and flA protein. 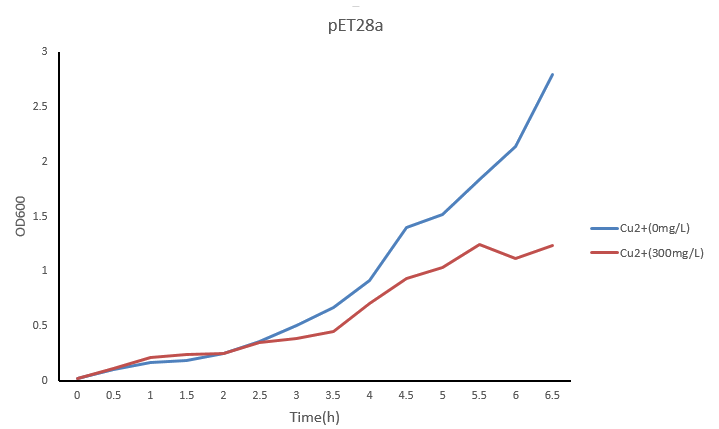 We constructed the plasmid pET28a-oprF-CBP and get the growth curve of it first. Figure 6.3: Growth curve of normal bacteria carrying vector in culture environment with or without Cu2+. Under high concentration of copper ions, bacteria significantly grow slower than that in normal water. It revealed that the high concentration of copper ion is indeed harmful to the growth of bacteria. 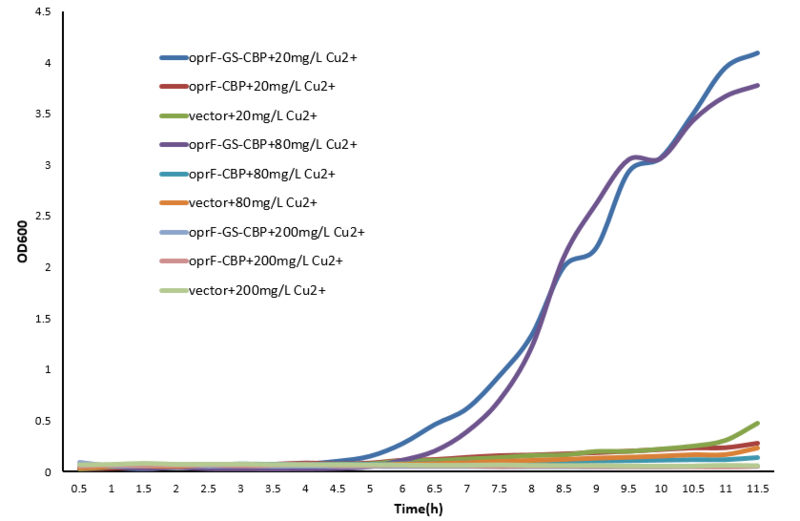 Figure 6.4: Growth curve of bacteria carrying vector/oprF-CBP/oprF-GS-CBP in culture environment with different Cu2+ concentration. <p>Contrary to our expectation, the growth of bacteria carrying oprF-CBP grew as normal as control bacteria carrying pET28a vector in Cu2+ environment. The possible reason is that fusion-expressed CBP and oprF are so close to affect the function of CBP. Without CBP capable of binding to copper ions, the E. coli carrying oprF-CBP loses its tolerance of high concentration of Cu2+. Meanwhile, the expression of heterologous protein reduces the competitive advantage of our transformant. These two mechanisms work together to result in the slow growth of E. coli carrying oprF-CBP. To cope with the problem, we added a GS-linker between oprF and CBP to reduce the spatial interaction. We were very excited to see that our method works! The growth of E. coli carrying oprF-GS-CBP is significantly and consistently better than that of E. coli carrying oprF-CBP or pET28a vector. It proves that 1) a GS-linker is necessary for the normal function of CBP when expressed as a fusion protein with oprF; 2) our oprF-GS-CBP motif can effectively increase E. coli's the tolerance of Cu2+. To know more about the part oprF-GS-CBP, please refer to http://parts.igem.org/Part:BBa_K1393000:Experience#Usage_and_Biology .